In recent years unauthorized immigrants known as "dreamers" have captured nationwide attention and become a force in American politics. Brought to the United States as children, these young adults came forward to ask for the right to give back to the country they call home. With protection from deportation, they say, comes the ability to pursue higher education and forge careers, to move from fear and uncertainty to planning a future with purpose. In 2012 their call was answered with Deferred Action for Childhood Arrivals (DACA), which awarded temporary work permits and protection from deportation to childhood arrivals. Today the program covers about 800,000 immigrants. For many DACA recipients there is more at stake than a college degree or dream job: they are also parents to children born in America. The anxiety surrounding the family's immigration status can be detrimental to the health and development of the U.S. citizen children. As Congress and the Trump administration consider whether to extend or cancel the program, those children are often overlooked, though their well-being hangs in the balance. How do their lives change when their parents no longer fear being deported? ''DACA is the largest immigration reform in the US since the mid-1980s, but so far there have been almost no credible studies of how it has affected unauthorized immigrants and their families. Hence, policymakers have lacked concrete evidence to make informed decisions about the future of DACA", says Linna Martén, a postdoctoral scholar at the Stanford Immigration Policy Lab and co-author of a new study examining the intergenerational effects of DACA. The results show that protecting unauthorized immigrant parents from deportation leads to dramatic improvements in their children's mental health. About 4 million children born in the United States have at least one parent who is unauthorized. Research suggests that fear of separation is a significant source of stress for these children, but it is difficult to pin down how their disadvantages stem from immigration status as opposed to poverty, cultural barriers, or other factors common among unauthorized immigrants. Most previous studies have provided evidence of correlations, not the causal consequences of immigration status. When examining unauthorized immigrants one must also clear another hurdle: finding a large sample of people who by definition are excluded from most surveys and are reluctant to identify themselves. With DACA comes the opportunity for a creative solution to these research limitations. An interdisciplinary team including members from Stanford University, Oregon Health and Science University, the Stanford School of Medicine, and Northwestern University designed a novel strategy to identify the intergenerational health effects of DACA. First, the researchers used data from Oregon's Emergency Medicaid program, which is used for pregnancy coverage by immigrant women who do not qualify for traditional Medicaid. As U.S. citizens, the children born to these mothers were eligible for full-scope Medicaid, so they could be tracked through their medical claims. Second, they took advantage of one of the program's criteria for eligibility: individuals born before June 15, 1981 are not eligible, while those born after are eligible if they fulfill the other criteria. On either side of that date are nearly identical groups of mothers, women with no meaningful differences other than their eligibility for DACA. "Evaluating the consequences of immigration status is often challenging, since it is not randomly assigned, but the arbitrary DACA age cutoff created a natural experiment. We also conducted several tests that confirmed that their children had similar background characteristics and health status before DACA was implemented", says Jens Hainmueller, Stanford professor and co-director of the Immigration Policy Lab. The researchers narrowed in on 5,653 mothers born just before and after the cutoff date for DACA eligibility. Among the 8,610 children born to these mothers between 2003 and 2015, the researchers looked for a range of mental illnesses known to be provoked by external stress, including adjustment disorder, acute stress disorder, and anxiety disorder. Why were these so important? Imagine a child who can't sleep, who is withdrawn and depressed, who doesn't participate in school activities or who lashes out at teachers and other kids. Mental illness at such an early age can set the child on a path for a lifetime of challenges, from low education to dependence on welfare to poor physical health and substance abuse—personal struggles with high social costs. Childhood mental illness also accounts for the highest share of the nation's pediatric health care spending, reaching $13.8 billion in 2011 alone. Before DACA was introduced, the two groups of children, as you might expect, were diagnosed with these disorders at roughly the same rate. After DACA, a gulf immediately opened between the two groups on either side of the mothers' birthdate cutoff: Among those whose mothers were eligible, the rate dropped by more than half, from 7.8 percent to 3.3 percent. 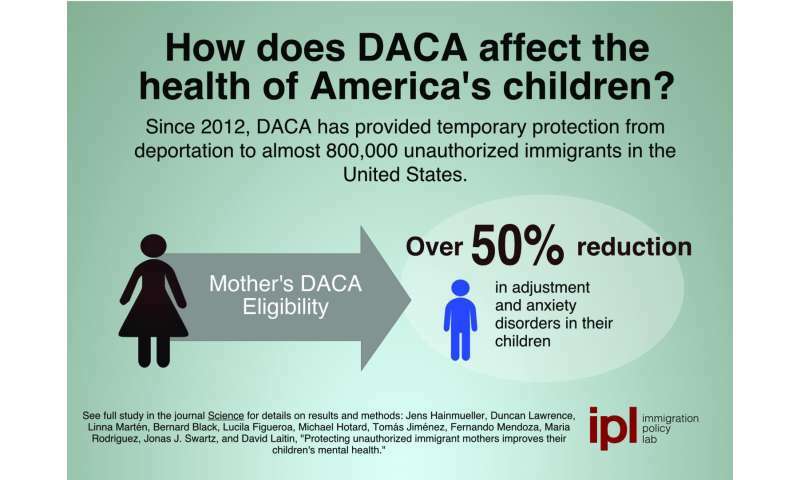 "Our results imply that expanding deferred action, or providing more permanent protection, to the millions of unauthorized immigrant parents who do not meet the current DACA eligibility criteria could equally promote the well-being of their children. This would have important implications for this next generation of American citizens", says Duncan Lawrence, executive director of the Stanford Immigration Policy Lab. Policy shifts at the federal level can take a while to be felt on the ground, but these findings show that the benefits of DACA were almost instantaneous in giving young children security and peace of mind. This evidence suggests that policy choices have the power to either consign these children of immigrants to the same disadvantages as their parents, or to lift them into the healthy trajectory that other U.S. citizen children enjoy from birth. "Compared to other social determinants of children's health, this is the only one I know that can be changed by a simple legislative or executive act. All the other social determinants we have been trying to improve in child health have been very difficult to change", says Fernando Mendoza, Stanford professor of pediatrics. As policymakers deliberate over DACA's future, they should consider the program's broader impact, which may extend for decades and have life-altering consequences for U.S. citizens. This leftist propaganda is the same politics that ruined Venezuela. Rewarding this criminal foreign invasion would bring the same destruction to America. The foreign invaders brought disease and use up finite medical and welfare resources while American taxpayers foot the bill. Third world poor come to America to breed and create overpopulation. American values are being used as propaganda to destroy American values. If these foreign invaders had any worth they could have stayed in their homeland and copied America's creation of value rather than jumping the immigration queue to leech America's wealth. DACA invaders are not in America to learn and assimilate but to replace American culture with unproductive third world culture. Destroying western civilization hurts the future of humanity. "Federal immigration officials arrested nearly 1,400 gang members in a nationwide 6-week operation, including illegal immigrants gang members who had protected status under [DACA]... Since DACA's inception, more than 1,500 illegal immigrants have had their protected status revoked after they were found to be involved with a gang or committed a crime." -If libs were serious about this they would own up to actual statistics and accommodate them, and not just make it another disgusting political issue. This is why we hate them. Monkeys will fling verbal poo.